New York, NY (February 2014) – As we anticipate the arrival of spring and warmer weather, we are counting down the days to Taste of Tribeca (www.tasteoftribeca.org), a one-of-a-kind outdoor culinary festival that celebrates downtown local flavor. Celebrating its 20th year milestone, this highly regarded annual event will take place on Saturday, May 17th from 11:30am to 3pm, rain or shine, on Duane Street (between Greenwich and Hudson Street) in Tribeca. All proceeds will ensure the continuation of arts and enrichment programs at local public schools, PS 150 and PS 234. The festival will bring together Tribeca’s top chefs and restaurants, including Bouley, The Bubble Lounge, Bubby’s Tribeca, Duane Park Patisserie, Gigino Trattoria, The Odeon, Tribeca Grill, and Walker’s, who have all participated in the annual event since the beginning; as well as exciting newcomers. In January, we kicked off this year’s Taste with a lovely Open House hosted by Tribeca Grill to welcome our participating restaurants. The community is very excited to be a part of our 20th year celebration. In addition to restaurant tastings, there will be a special VIP section, live entertainment, wine tastings, and more! 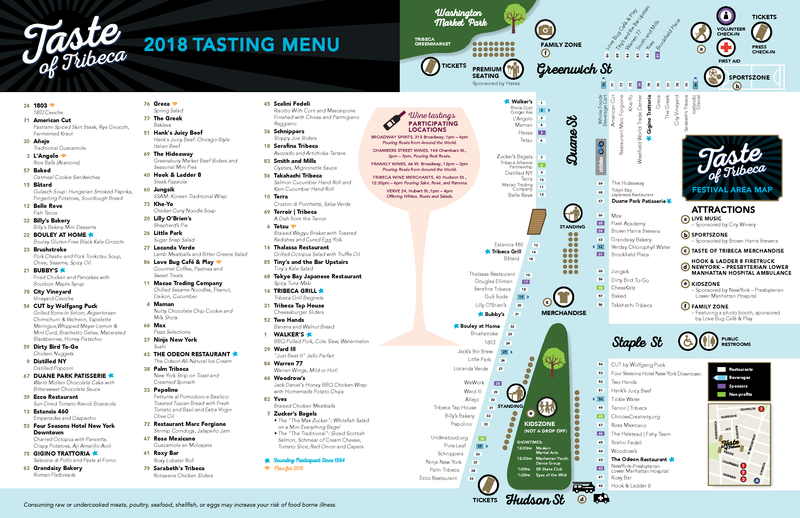 General Tasting Card ($45/advanced purchase; $50/day of event), provides six tastes from any of the participating restaurants. Premium Seating ($350, $680, $950 for tables of two, four and six), includes personal food runners, reserved seating, designer t-shirts and a gift bag from the Taste of Tribeca sponsors. We look forward to celebrating with you at this year’s Taste of Tribeca. Follow us @TasteofTribeca #tasteoftribeca #tot2014.